9Mobile Unlimited free browsing cheat is blazing now on GO VPN app for Android phones this 2019. Though the cheat is slow but gets faster when downloading with UC mini handler app. We all are aware that the era of free browsing is gradually fading out as our telecom companies are wiser and blocks every possible loophole but the interesting part is they also offer affordable data plans that anyone can subscribe and get connected online. You can check available data plans from all the networks in Nigeria here. 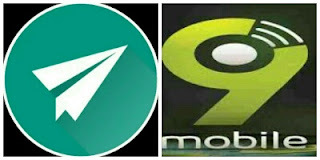 So sit back relax and see how to setup this Go VPN for 9Mobile free browsing cheat on your Android device. But before I unveils the procedures on how to activate and use this cheat for free, permit me to introduce the wonderful app behind it. 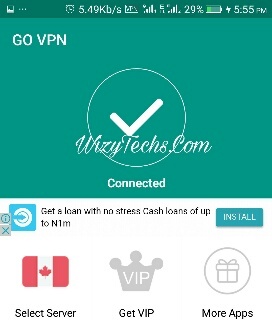 The app is called Go VPN, just like other virtual private network apps, it helps you bypass blocked or restricted websites as well as giving you access to both free and VIP servers from various top countries like United states, Canada, France, to mention but a few. ✔️ EASY - No set up, no registration, no signup, no settings, just click and go! All you do is install it and push the ON button! ✓Largest VPN Coverage - GO VPN offers VPN coverage including ,US,UK,CA,JP and more countries. ✓ Unparalleled VPN Performance - our proprietary servers ensure the fastest VPN speed, most stable and secured connections. The app offers a high-speed and encrypted VPN connection to your smartphone or tablet. Unblock your favorite websites and apps with GO VPN any time! ✔️ Now it will connect but if it doesn't, go back and tap on "Paper Plane" to connect VPN. Hurrah... You have successfully connected the cheat and you can now start enjoying it. If you are confused or didn't get the procedures very well, you can see the screenshots. SEE ALSO: Airtel Cheat 2019 and Hammer VPN Cheat For MTN Free Browsing. One of the disadvantages of this cheat is that it's slow but to make it faster, download UC mini browser to browse and download your favorite stuffs. It's much better for downloading though. If it works for you also, kindly hit the share buttons. Click here for the settings for uc mini handler for Glo cheat. Note: you don't need to configure uc mini for this 9Mobile cheat. Once Go VPN connects, launch your uc mini and start using it. The Glo setting is not working for now as glo network doesn't come up without data. Fake. Doesn't work. Stop posting what you didn't test.